Last week we participated in our first Networking Field Day 9 (NFD9), which was a milestone for NetBeez. We reached the point of presenting NetBeez to the top members of our community, have engaging discussions with them, and, last but not least, getting valuable feedback that will help us make NetBeez an even better and more indispensable tool for every network engineer. We kicked off the second day of NFD9 and all delegates were fired up, even early in the morning. Between a Twitter storm and a deluge of questions by the panel, we flew through the two hours of our slot. Stefano started with a presentation laying the groundwork for the need of distributed end-user monitoring. The Networking Field Day was the ideal stage to announce the latest addition in the BEEZ family: WiFi monitoring agents! The vast majority of users in education, retail, and healthcare rely on WiFi for their network access and being able to capture the status of the network and troubleshoot intermittent or constant issues is of utmost importance. Q: How many agents can you support? A: As of now 200. We are working on making this hundreds. Q: How is agent deployment done? 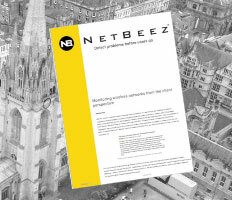 A: The customer just plugs in the agent on the access layer and the agent appears on the NetBeez dashboard (the agents come preconfigured with the address of the server). Q: How do you handle security? A: The agents don’t have any inbound ports open. Finally, each delegate left the event with one of the BEEZ in their luggage so that they can test drive NetBeez themselves. We are continuing the discussion offline with the NFD9 delegates, and we’ll follow up with another blog post addressing several other questions. Stay tuned!